If you have not already read Nancy Colleton’s new piece in the Washington Post’s Capitol Weather Gang, “Weather Data: a national security priority,” it’s worth a look. In the piece Colleton, who is President of the Institute for Global Environmental Strategies, lays out the need for better forecasting and weather data collection capabilities and why this is a matter of national security, especially in the face of a changing climate where extreme weather events are likely to be more frequent and intense. An ounce of prevention is worth a pound of cure. In the meantime, the response to the floods has been exemplary. And though the extent of the toll of the Colorado floods is not yet clear (and neither are the details about any possible role of climate change), the role of the national security community in responding is clear. 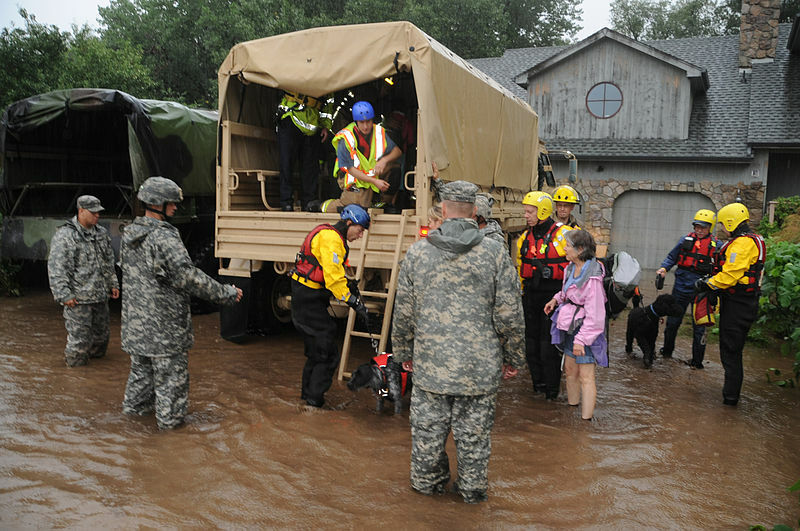 In another Capitol Weather Gang post on the Colorado floods, it was noted that: “Today, the biggest civilian airlift operation is underway since Hurricane Katrina, searching for and seeking to rescue over 1,200 missing/stranded people in vast areas completely cutoff by floodwaters.” Another article describes how the National Guard is working with local emergency responders to help those who have been isolated by the flood without access to roads, telephones, water, power or sewage. In addition to the Colorado floods, the National Guard and emergency responders have also been lending crucial support to combating the Yellowstone Rim Fire and other weather events around the country. How to better prepare for these types of events certainly deserves more attention. A first step is understanding that they don’t happen in isolation. For example, Monte Morin notes in an interesting article in the Los Angels Times, “Meteorology and geography collide in Colorado flooding,” that the extensive drought that preceded the floods was also a factor in their severity. We’ll need to look into that some more, as well as how improving satellite information and weather data capabilities can potentially save lives, and reduce stresses on already stressed emergency responders. By Caitlin Werrell and Francesco Femia in climate and security on September 18, 2013 .